In 1526, the first recorded sport shoe was a "football boot" in King Henry VIII's Great Wardrobe. In so many words, this was an early pair of soccer shoes. Over the next 500 years, sports shoes changed considerably, evolving to today's cleats and turf shoes found in football, soccer, baseball, lacrosse and other sports. Cleats consist of a standard designed shoe on all sides and come in high top and low-top heights. The bottom of the shoe varies in stiffness depending on the make and manufacturer, and is usually covered with eight to 15 cleat studs. Cleat studs can be made of metal or rubber, depending on the sport, and are limited to a length of a half inch by most leagues. Turf shoes are designed with maximum mobility in mind and offer very little stiffness on the sole of the shoe. The height of turf shoes is mostly low-top, and the underside of the shoe features dozens of small rubber studs with very little spacing between each stud. The main purpose of a cleat is to provide you with maximum traction in a soft grass or mud laden field. The height of the shoe varies depending on the amount of ankle support you desire. Low tops provide minimal ankle support but allow maximum mobility, while high tops provide strong ankle support but severely limit your mobility. The cleat studs are meant to dig into ground upon impact to help avoid slippage. Turf shoes are designed specifically for artificial turf surfaces. The small rubber studs grip the turf surface and assist in pushing off on a foot with minimal slippage. On a sloppy, muddy field, cleats can provide you with traction and the ability to change direction without falling or pulling a muscle due to an unexpected slip. The sole sturdiness of cleats also reduces your chance of pulling a muscle on the bottom of your foot or suffering from turf toe. Turf shoes, while on muddy fields may be rendered useless, can be ideal on artificial turf. Thanks to the gripping action of the tiny rubber cleats, you can achieve much higher speeds than if you were wearing running in shoes or cleats. Some sports such as baseball sometimes involve a field that consists of both artificial turf and dirt. While turf shoes may provide excellent traction on the artificial turf in the outfield, you may find that cleats allow for much better traction on the dirt infield. Take into account your position on the field when choosing your type of shoe. Injuries are unfortunately a common drawback of playing competitive sports, especially those involving intense physical activity. It's not uncommon for even well-trained professional athletes to take one misstep and twist or break an ankle while wearing low-top shoes. 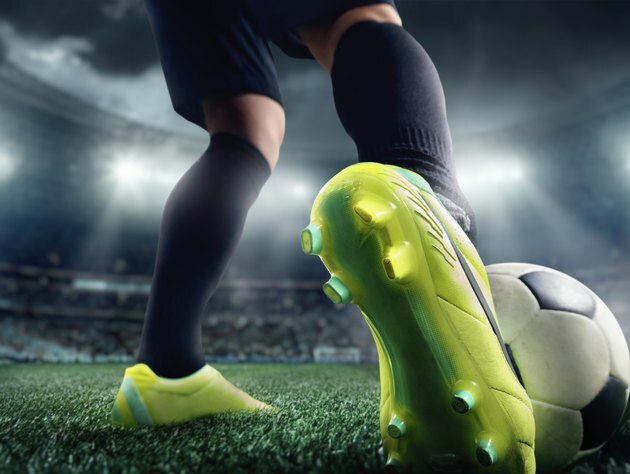 Turf shoes also provide very little sole support, and while they may allow for more mobility and traction, they have been known to cause a much higher number of turf toe injuries than cleats. Are Low-Top Basketball Shoes Safe?